Christmas This Year Holiday Costume. 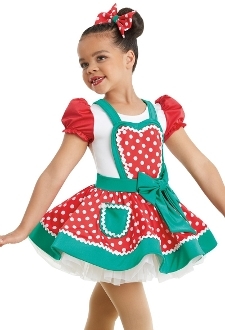 Pinafore dress made of polka dot poly/ spandex trimmed in contrast shiny spandex and ric rac. A bow is attached at the waist and the skirt features a decorative pocket. Attached blouse is made of shiny spandex with puff sleeves. Attached tricot underskirt and briefs. Glitter free! Imported. Includes polka dot hair bow. Available in Child XS - XL.